How does a company’s structure and ability to adopt new tech affect it’s ability to evolve strategically? We continue our Leadership Hall of Fame series, a year-long look at the top business books and authors, with an excerpt from The Innovator’s Dilemma (1997) by Clayton M. Christensen. From the earliest studies of the problems of innovation, scholars, consultants, and managers have tried to explain why leading firms frequently stumble when confronting technology change. Most explanations either zero in on managerial, organizational, and cultural responses to technological change or focus on the ability of established firms to deal with radically new technology; doing the latter requires a very different set of skills from those that an established firm historically has developed. Both approaches, useful in explaining why some companies stumble in the face of technological change, are summarized below. The primary purpose of this chapter, however, is to propose a third theory of why good companies can fail, based upon the concept of a value network. The value network concept seems to have much greater power than the other two theories in explaining what we observed in the disk drive industry. One explanation for why good companies fail points to organizational impediments as the source of the problem. While many analyses of this type stop with such simple rationales as bureaucracy, complacency, or “risk-averse” culture, come remarkably insightful studies exist in this tradition. Henderson and Clark, for example, conclude that companies’ organizational structures typically facilitate component-level innovations, because most product development organizations consist of subgroups that correspond to a product’s components. Such systems work very will as long as the product’s fundamental architecture does not require change. But, say the authors, when architectural technology change is required, this type of structure impedes innovations that require people and groups to communicate and work together in new ways. Because an organization’s structure and how its groups work together may have been established to facilitate the design of its dominant product, the direction of causality may ultimately reverse itself: The organization’s structure and the way its groups learn to work together can then affect the way it can and cannot design new products. In assessing blame for the failure of good companies, the distinction is sometimes made between innovations requiring very different technological capabilities, that is, so-called radical change, and those that build upon well-practiced technological capabilities, often called incremental innovations. The notion that the magnitude of the technological change relative to the companies’ capabilities will determine which firms triumph after a technology invades an industry. Scholars who support this view find that established firms tend to be good at improving what they have long been good at doing, and that entrant firms seem better suited for exploiting radically new technologies, often because they import the technology into one industry from another, where they had already developed and practiced it. Clark, for example, has reasoned that companies build the technological capabilities in a product such as an automobile hierarchically and experientially. An organization’s historical choices about which technological problems it would solve and which it would avoid determine the sorts of skills and knowledge it accumulates. When optimal resolution of a product or process performance problem demands a very different set of knowledge than a firm has accumulated, it may very well stumble. The research of Tushman, Anderson, and their associates supports Clark’s hypothesis. They found that firms failed when a technological change destroyed the value of competencies previously cultivated and succeeded when new technologies enhanced them. The factors identified by these scholars undoubtedly affect the fortunes of firms confronted with new technologies. Yet the disk drive industry displays a series of anomalies accounted for by neither set of theories. Industry leaders first introduced sustaining technologies of every sort, including architectural and component innovations that rendered prior competencies irrelevant and made massive investments in skills and assets obsolete. Nevertheless, these same firms stumbled over technologically straightforward but disruptive changes such as the 8-inch drive. The history of the disk drive industry, indeed, gives a very different meaning to what constitutes a radical innovation among leading, established firms. As we saw, the nature of the technology involved (components versus architecture and incremental versus radical), the magnitude of the risk, and the time horizon over which the risks needed to be taken had little relationship the patterns of leadership and followership observed. Rather, if their customers needed an innovation, the leading firms somehow mustered the resources and wherewithal to develop and adopt it. Conversely, if their customers did not want or need an innovation, these firms found it impossible to commercialize even technologically simply innovations. Reprinted by permission of Harvard Business Review Press. 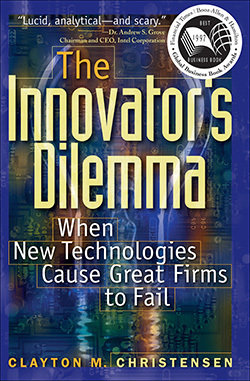 Excerpted from The Innovator’s Dilemma: When New Technologies Cause Great Firms to Fail by Clayton M. Christensen. Copyright 1997 by the President and Fellows of Harvard College. All rights reserved. Read more about The Innovator’s Dilemma or our Leadership Hall of Fame.